Get instant 100% natural colour and deep hydration with our coconut infused lip butter. Supernatural ingredients, excellent antioxidant properties and long lasting wear will make you fall in love with this incredible formula. Sweetened with stevia for just the right amount of flavour for your kisser. Beautifully hydrates your lips with long lasting mineral color with high colour payoff. Our Coconut Kiss Creamy Lip Butter is easy to wear with hard working stay put shine. It`s a great alternative to lip balm. Brassica campestris (canola) aleurites fordi (tung tree) oil copolymer, punica granatum (pomegranate) sterols, mangifera indica (mango) seedbutter, theobroma cacao seed butter, simmondsia chinensis (jojoba) esters, helianthus annuus (sunflower) seed wax, caprylic/capric triglyceride (from coconut oil), parfum (all natural), persea americana (avocado ) oil, cocos nucifera (coconut oil), tocopherols (vitamin E), eupatorium rebaudianum bertoni (stevia) leaf extract. May contain: melia azadirachta leaf extract, coccinia indica flower extract, mica, titanium dioxide, iron oxides, vaccinium macrocarpon fruit (cranberry), daucus carota sativa root (carrot), solanum melogena fruit extract, curcuma longa (tumeric) root extract, and beta vulgaris (beetroot). Use finger tips or a brush and apply to lips anytime, anywhere. 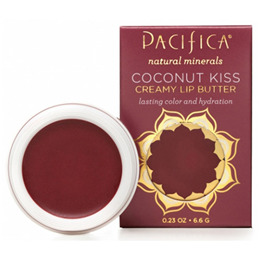 Below are reviews of Pacifica Coconut Lip Butter Blissed Out - 6.6g by bodykind customers. If you have tried this product we'd love to hear what you think so please leave a review. Get instant 100% natural colour and deep hydration with our coconut infused lip butter. Supernatural ingredients, excellent antioxidant properties and long lasting wear will make you fall in love with this incredible formula.